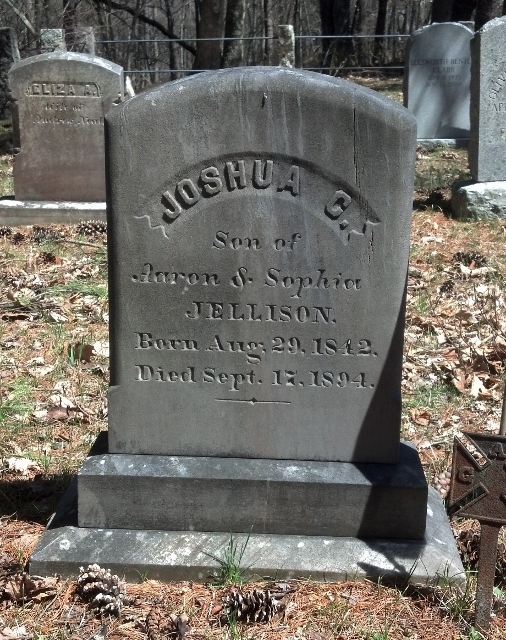 JOSHUA CHASE JELLISON was born on 29 Aug 1842 [YCCI, pg 2091] in South Berwick, the son of Aaron and Sophia (Chase) Jellison. He died there on 17 Sept 1894 from dysentery [ME Death Rec], and is buried in the family plot on Emery's Bridge Rd in South Berwick [YCCI, pg 2091]. He married, on 21 Dec 1871 in South Berwick [VR of Berwick, So Berwick and North Berwick, pg 489], to ALMA P LORD (marr rec calls her Almira), the daughter of Rufus and Sally (Chase) Lord. She was born in Hollis, ME on 8 Jan 1837 [Death Rec], and died in South Berwick on 17 Aug 1903, from chronic inflamation of the spine [ME VR]. 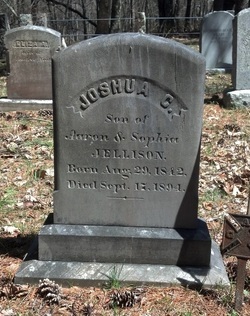 She was buried with her husband in his family's plot in South Berwick [YCCI, pg 2091]. Following the Civil War, in which both Joshua and his brother William served together in the 27th Maine, he became an engineer. He removed to Great Falls (Somersworth) by 1878, working with the railroad there. In 1881, he moved to Portsmouth, engaged as an engineer with the Portsmouth Shoe Co. By 1888, he was living on Park St in Dover, NH, working for the "S M Co" (not sure which business this was) as an engineer/machinist. He is seen in the Dover street directories through 1892, returning to South Berwick prior to his death. His widow Alma would remove to Taunton, MA in 1900, where she lived in the household of William E Knight, another former South Berwick resident. She lived there until 1903, when she moved back to South Berwick. No records have been found showing that Joshua and Alma had any children. 1900, '01, '02, '03 Taunton, MA St Dir: Alma P, widow, bds at 18 Chester (hh of William E Knight); latter dir shows Alma "removed to South Berwick"